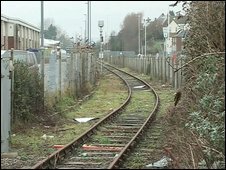 A train line, which enthusiasts believe could be used to take spectators to the 2012 Olympic sailing events, has been taken over by a Dorset council. Weymouth and Portland council voted to acquire the 150-year-old seafront track from Network Rail in a £50,000 deal. Councillor Howard Legg said the line would either be scrapped, preserved for future use or left as it is. The last service ran in the late 1980s but tracks to the quayside remain and the route is still regarded as viable. Enthusiasts would like to see it saved and used for transport in the Olympics. One idea is to incorporate the track into a light railway system to serve spectators to the sailing events on Portland. Michel Hooper-Immins, a travel writer and train enthusiast, said reopening the line was a "wonderful opportunity" to take Olympic spectators to the seafront in 2012. But Councillor Legg said the final decision, including any attempts to revive the line, would rely heavily on any funding available. "As everything at the moment, any decision relies on money," he added. "The track could be left, preserved as some sort of museum piece or removed, but the option must be financially viable." Councillors wanted to take over the line because £6.6m plans to transform Weymouth's seafront in time for the Olympics require the redevelopment of the station. The line used to take travellers to the Channel Island ferries. There have been attempts to reopen it but the council said none had been financially viable.